Born in Brussels, Belgium, John Urbain was only two years old when his family immigrated to Detroit, Michigan. His parents were supportive of his precocious interest in art and arranged for him to attend the Cass Technical School to advance his skills. In 1941, Urbain was drafted by the United States Army and stationed at Fort Custer in Battle Creek, Michigan, where his skills were employed as an illustrator. He also he saw action in France and the Black Forest area of Germany before being discharged in 1945. Using the GI Bill, Urbain enrolled at Black Mountain College at the suggestion of his friend and fellow Detroit resident, Ray Johnson. 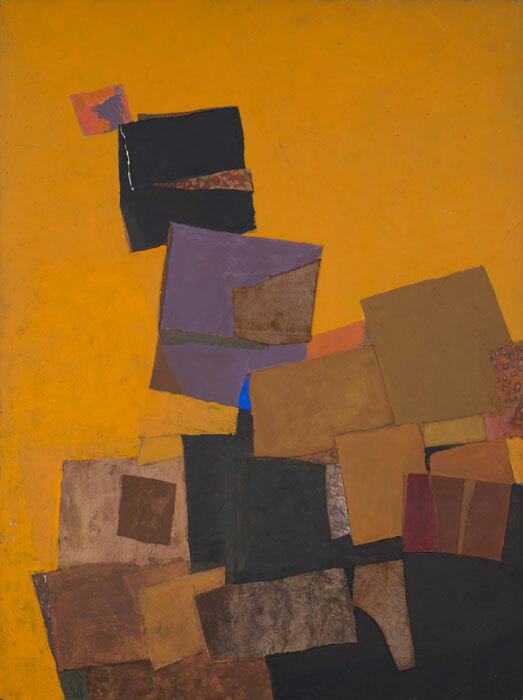 During 1946 and 1947, Urbain studied under Josef Albers whose emphasis on color theory and the materiality of paper influenced his future career. While there, he met his future wife Elaine Schmidt, with whom he collaborated on several stained glass mural commissions. Urbain found employment first as art director for a New York advertising firm and then became the assistant art director for Ladies Home Journal in Philadelphia. The young couple departed for Paris in 1950, and spent the next two years as students at the Académie de la Grande Chaumière and the Académie Julian. Upon their return to the United States in 1953, Urbain did design work for a variety of concerns including the Cancer Society of America, DuPont, Cosmopolitan magazine, and Everywoman’s Magazine. He later became the art director for the Philip Morris Company, where he was instrumental in forming its corporate art collection. Urbain’s own work consisted of colorful collages that reveal the significance of his Black Mountain experience. He had steady gallery representation in New York and in 1995 was honored by a retrospective exhibition at the Hurlbutt Gallery in Greenwich, Connecticut. In 2013, the Black Mountain College Museum + Arts Center mounted a posthumous retrospective of his work. Urbain’s work is included in major American museums including the Brooklyn Museum and the Museum of Modern Art, among others.